In this tutorial we will be creating a riser effect. Absynth is great for this types of effects because of it’s amazing envelopes. With them you can very precisely specify timing and speed and also accurately control the energy and intensity of riser effect. 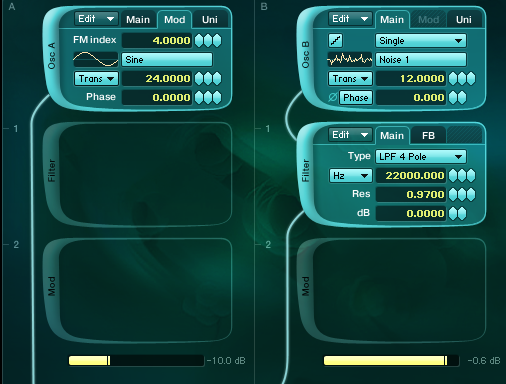 We will also look into envelope in LFO mode which offers some great new possibilities. We will use filtered noise to create first part of our riser effect. Choose Noise 1 waveform from simple Waves menu. Let’s first edit the amplitude envelope of Oscillator B. First set the envelope to release mode. This will ensure our envelope will run simply from the beginning until the last break-point is reached. If we would leave it in sustain mode, it would stop at the sustain portion of the envelope and wait there until the note is held and proceed to the release portion of the envelope (the green part of the envelope) when the note is released. Instead we want to fade envelope with a release stage in the end. Also be sure to Sync the envelope to ensure it follows the tempo of your host. I have chosen the 1/8 resolution of the envelope display and also enabled Grid function. Now we see envelope in 1/8 bar resolution. So 8 of this time measures equals one bar. So in the Absynth envelope display this means from 0.00 to 4.00 is one bar long. We need four bars long envelope so the overall length of the envelope should be set to 16.00 units in Absynth envelope window. Also adjust the slope of the envelope to something like this. You do that by dragging a small dot between two breakpoints. Now we need filter module. Enable Filter B and set it to LPF 4-Pole. Set cutoff to 22000 and resonance to 0.9700. This high resonance setting ensure we will get that almost ringing like effect in our riser. Right click on the filter frequency control and choose Create new envelope entry from the drop down menu. Again, enable Sync and Grid buttons and set it to be 4 bars long (16 units in Absynth envelope window). You can see I haven’t set the filter envelope to start from it’s lowest point but from 260 Hz as we can see in the break-point display. We don’t want our filter to start from fully closed cutoff position since we still want to hear some of the sound from the very beginning of the riser effect. Also adjust the slope to something like in the picture above. One great thing in Absynth is we can modulate also the Noise waveform pitch. Right click on the Osc B frequency control to add new envelope. Now we have to set the pitch modulation start value. Click on the first break-point and set it to -48.000 semitones like in the picture below. So the pitch of our Osc B will rise from -48 semitones of our MIDI note to 0 semitones. Go and set Osc B transpose value to +12. So the pitch envelope will now go from -48 semitones to +12 semitones as the parameter value represents also the highest point of any assigned envelope in Absynth. Now we have our basic riser sound. We should also add another oscillator to get something a bit more exciting. For now disable Osc B so we will monitor only Osc A. We will use FM oscillator so set Osc A to FM mode. Let’s adjust the amplitude envelope of Osc A first. Again, set envelope in release mode and set it like in the picture below. We do this to avoid any clicks and sudden and abrupt volume changes by fading the envelope right before it ends. Set the pitch of Main Osc A to +36 semitones. Assign new pitch envelope by right clicking on the Main oscillator pitch control parameter. So the maximal point envelope can reach is +36 semitones. Now to the modulating oscillator. When oscillator is in FM mode, the Mod osc modulates the frequency Main oscillator in audio rate. The amount of modulation is set with FM index value in the Mod oscillator. Set the frequency of mod oscillator to +24 semitones and FM index parameter to 4. Now let’s modulate the Mod oscillator A pitch with envelope. Set the envelope to start from 0 semitones to max value which is +24 semitones. As you can hear these gives us some interesting timbre. Enable LFO tab in the Oscil A Mod Pitch Envelope window by clicking on it. This will transform your envelope in a very complex LFO. 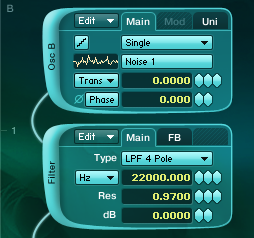 In the LFO panel above you can now adjust the LFO waveform, depth and speed parameter. And the best thing is these settings are carried out individually for every break-point. So you can assign different settings to each break-point and create very cool modulations which would take a great amount of time if you would draw automation in your DAW for instance. Note that the very first break-point of the envelope cannot be automated. But you can create a new one, right next to it so this is not a limitation really. Create additional break-point in the beginning of the envelope. Now set the LFO control for each break-point by clicking on it. Here are my settings for all three editable breakpoints. LFO settings for each break-point. 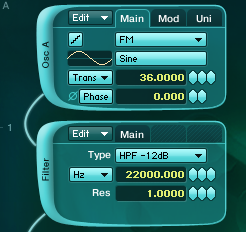 You can also choose different waveforms for LFO’s shape. Also you can use envelope LFO in Sample and Hold mode. To enable this mode click on the LFO mode button (button on the right side of the Phase parameter). This means that new value from the LFO waveform will be sampled at constant time interval which is set with S/H Sec parameter in seconds. This can produce some cool random like effects. We wont use this function for now so set envelope LFO back to settings described above. We could also add HP filter to Osc A channel to limit the frequencies of our FM part. I have used HP filter with high resonance setting and also automated the filter A cutoff frequency. With Absynth envelopes you can very accurately control riser effects. Here is the same patch, I’ve just changed the slope of Filter B so the filter frequency rises more gradually. There are many other great possibilities for riser creation in Absynth. We have only scratched the surface. We haven’t even touch great audio modulation effects in Absynth also some very cool stuff can be done with Absynth’s master effects. Or maybe wave morphing. But let’s stop here and save something for the future tutorials. If you have trouble understanding something in a tutorial or any other questions or comments please leave them below.